New Delhi, 6th July 2017: The Indian Railways is now planing to launch ‘Give-It-Up’ campaign in which senior citizens will have the option to give up their concession on train tickets. Although it will be optional in which the passengers will have the option either to avail full concession, to avail 50 per cent concession or not to avail any concession on the railway ticket. 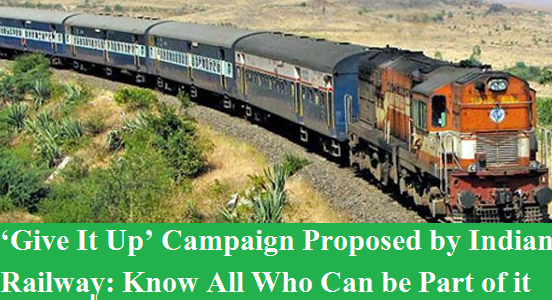 ‘Give It Up’ Campaign Proposed by Indian Railway is likely to be implemented in August. Currently, passengers have the option either to avail full concession or not to avail the concession. In a similar mission launched by the Ministry of Petroleum, more than 10.5 million liquefied petroleum gas (LPG)-consuming households opted out of the subsidy, saving more than Rs 4,000 crore for the government exchequer. Last month, a passenger sent a cheque of Rs 950 to Railways to give up the subsidy borne by the government on the train fare between Jammu and Delhi. He saw the message written on his ticket about the 43 per cent subsidy borne by the Railways during his train journey. He then decided to forego the subsidy and sent a cheque of Rs 950 to IRCTC for a similar train journey undertaken by him and his wife on the Jammu Rajdhani. He also sent a letter addressing the Railway Minister stating that “he will never avail such financial benefits in future”. Indian Railways is now planing to launch ‘Give-It-Up’ campaign in which senior citizens will have the option to give up their concession on train tickets. Although it will be optional in which the passengers will have the option either to avail full concession, to avail 50 per cent concession or not to avail any concession on the railway ticket.